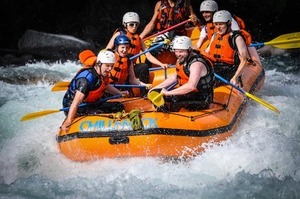 NOTE: Telephone lines to Chilliwack River Rafting's resort have been experiencing black out periods. If your call doesn't go through, please reach us by email, by facebook messenger, or by cell phone at 604-793-7499. From Highway 1 take Exit 119, drive south on Vedder Road to bridge, turn left at the bridge on to Chilliwack Lake Road (do not cross the bridge). Drive 9 kms on Chillwack Lake Road to our resort.